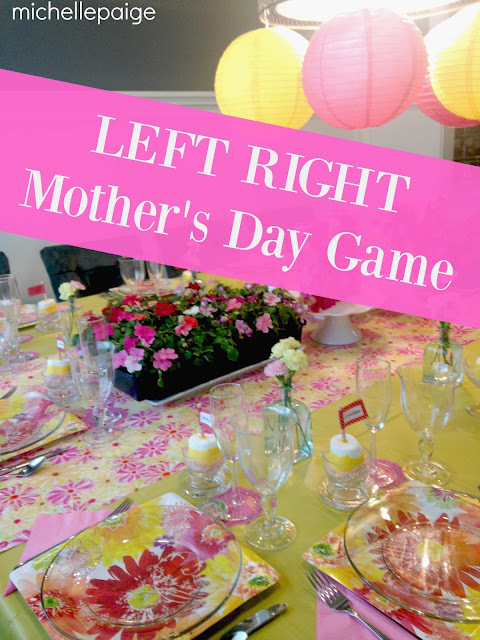 Need a fun game to play at the table for Mother's Day this year? 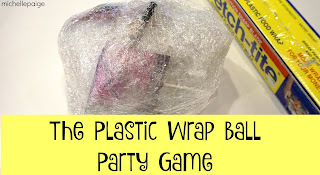 This game is for all ages and it's so simple, that everyone enjoys playing it. Even if a child doesn't know their left and their right, they'll still have fun following everyone else. It's called the Left Right Passing Game. You may have seen or played a Christmas version...but I wrote up a version perfect for Mother's Day. 1. Assemble identical wrapped favors for each player. The winning favor will need to have a special note or message inside. 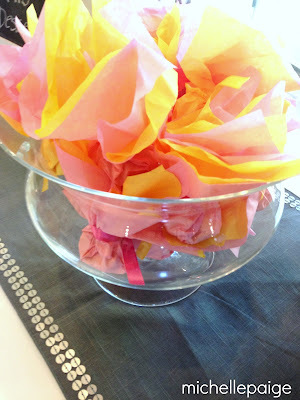 You could use lunch size paper sacks, or mini boxes or create these tissue paper pouches that I did. One favor needs to have a special note or sticker that will be found when the favor is unwrapped. 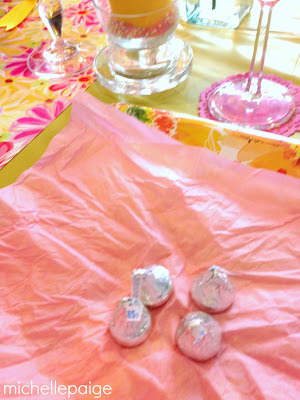 For my pouches, I placed 3 chocolate kisses in a 3-layered tissue paper square and tied it up with ribbon. We had 16 people, so I made 16 pouches. **For the winning favor, I added a little note that said Happy Mother's Day, before tying it with ribbon. 2. Print out the script- click here and assign a person to be the reader. The reader will not play the game, but instead will read the script aloud. 3. Each time the reader says RIGHT, everyone passes their favor to the right. When the reader says LEFT, everyone passes their favor to the left. 4. When the script is over, everyone opens the favor that they ended up with. 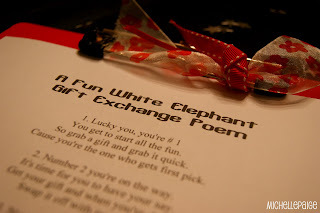 The one with the note inside is the winner of a special prize. 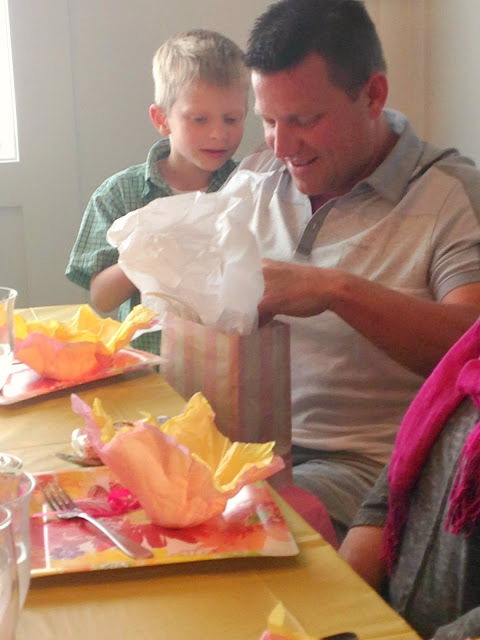 Our winner, my brother-in-law, received a box of licorice and a floral printed gardening trowel for mom. He immediately handed the trowel to his wife--perfect! We enjoyed this game so much, we plan to play it again this Mother's Day. ***Here's a little preview of the game. OK everyone, here’s the rules. When you hear the word RIGHT, you pass to the RIGHT. When you hear the word LEFT, you pass to the LEFT. Pay close attention, so you won’t be LEFT behind. ALRIGHT? Let’s get started. Moms are a special gift from God. He made them with just the RIGHT amount of love, care and wisdom. He gave them an extra dose of patience, hugs and understanding, too. Remember when you LEFT your toys out on the floor, who was there to help you pick them up? Mom, RIGHT? Or when you LEFT your lunch at home or LEFT the house without a coat or LEFT without your special permission slip…who came to your rescue? Mom, RIGHT? Click here to print the entire script. Happy Mother's Day to you!